This is a moderate overdrive pedal, referred to as a ‘D’ or Dumble type in reviews and sales blurb. Quite hard to find, it’s about the same price as many other highly-rated boutique overdrives like my HBE Power Screamer, the Providence Stampede and the Suhr Riot. It also seems to be drawing considerable controversy and criticism, and some pretty unsavoury online lynch mobbing on the forums, whose anonymous contributors accuse it of being nothing more than a repainted cheap Joyo pedal. See the rants section for more. What I can say is that it’s a great pedal, very transparent with a wide sweet spot. It works as everything from a clean boost to medium overdrive, with the alleged Dumble sounds happening between about 9 and 12 o’clock on the gain control. The high notes are articulate and singing while the bass notes don’t get muddy. Perhaps not to your taste, but it sure is to mine. Better yet, it retains the character and personality of whatever guitar is being played through it. To all those critics on the forums, I say that I frankly don’t know and don’t care if it’s a Joyo knockoff or filled with sawdust and cheese. It’s a damn fine pedal which justifies its price tag and makes you want to play. It has the signature and endorsement of Thaddeus Hogarth, a blues/fusion player I hadn’t heard of before but would now recommend. Great tone through his hideously-expensive Two Rock Custom Signature (I tried one once but found it needed to be cooking to get the near-Dumble sound and it was over £4k for the head alone!) 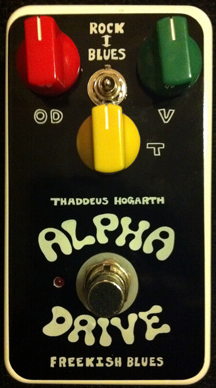 or his Alpha Drive – see this link.